If you don't work with acoustics as part of your everyday life, it can be a challenge to plan or correct for an acoustically appropriate space. We've all experienced uncomfortable, even unpleasant noisiness in everyday spaces where we work, shop, eat out and sometimes even where we live. The good news is that experts have defined "good" levels of noise for all these kinds of spaces, that help us benchmark and target our treatments. 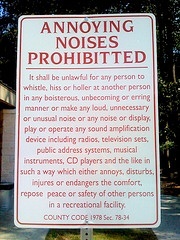 You've likely heard of "decibels" as an acoustical measure of the noise volume. HOW MUCH noise, the number of decibels (dB), quantifies the intensity of a sound. Mapped on a logarithmic scale, every additional 10 dB is experienced as about twice as loud. Some examples: a whisper is about 30 dB and a nearby jet engine is 140 dB. Normal human speech is about 60 dB. We experience pain in our ears at around 125 dB - which is about mid-range noise level for rock concerts! (Protect your hearing - use headphones or earplugs!) Hearing damage and loss results from a combination of decibel level and time and begins at 8 hours exposure to 85 dB (less time at higher dBs), driving occupational safety regulations for hearing protection when work is noisy. Obviously, the number of decibels in a room depends primarily on what's happening in it, or passed through from external sources via open windows and doors or non-soundproof structural materials. (Note: preventing pass-through noise is done with specific building materials and techniques. Acoustic panels fitted afterward will not help.) Library users generally make a lot less noise than do partiers! However, the room's surface materials then play an important role in what happens after the sound is first produced. Regardless of the volume of noise, its quality and our experience of it is greatly influenced by the environment in which it is heard. This video is a wonderful illustration of how the reverberation (or its lack) changes a sound in an open space vs an enclosed one and in spaces made of different surface materials. Basically, sound waves travel until they they either dissipate or hit a barrier. Then, depending on the qualities of that barrier, the waves will be absorbed by it and/or bounced back in some proportion - that is, the sound will reverberate. In an enclosed space, sound waves must either REVERBERATE or be ABSORBED. The RIGHT BALANCE of both is key to acoustic comfort. This will vary based on WHO is using the room and to what PURPOSE. Key to the discussion is this fact: excessive reverberation makes conversation difficult. The echoing sounds hurt speech clarity. We must make more effort both to speak and to hear. So, in any space where conversational clarity matters, acoustic absorption is required. Mounting absorbent acoustic panels in a space otherwise filled with hard, reverberating surfaces, can make the difference between conversational clarity and comfort vs a difficult, dysfunctional room. Acousticians use "Reverberation time", or RT in the work of assessing and enhancing the noise level in a room. RT is the measure expressed in seconds of the time it takes for a sound to decay by 60 decibels ... not coincidentally, about the usual level of the human voice. A room that is surfaced (walls, floors and ceiling) in hard non-absorbent materials such as drywall, cement, glass, brick and wood, may have an RT in 3-4 second range or much more. This high amount will increase and distort sound, making conversation difficult. High RT will also increase the noise level (decibels) in the space, both directly and indirectly, as people will raise their voices in an effort to be heard above the ambient noise. Workplace spaces such as meeting rooms and open offices need to prioritize speech clarity and minimize distractions. It's hard to have a free-flowing, creative and productive conversation in an "echo-y" space where sound is bouncing around a lot. Video/teleconferencing adds to the challenges for everyone involved. An optimum RT for meeting rooms is often around 0.5 to 0.6 seconds. For a home entertainment room where music and movies are the focus, we may want RT at 1.5 seconds or more to enjoy some resonance with that fabulous home theatre system. Your goal might be stated within a range at first. The specific end goal will also be influenced by the needs of the people who will be using the space, the starting RT of the room, the space available for acoustic panelling and the budget. Your acoustics provider can work with you to arrive at the best result for your situation. SO TAKE COMFORT in knowing that there is not a single "right" answer to the question of "How much acoustic panelling?" and take further comfort in knowing that you can easily get help in planning your acoustic installation. Other posts in this series will address calculating your sound absorption requirements and planning your installation, so you can work with your acoustics supplier to develop the plan that's right for you. Acoustics With Design is a Canadian distributor bringing beautiful acoustics products to interior designers and end-users. This is the second of a series of posts on the subject of acoustic panels, that will address when,where and how acoustic panels can enhance built environments and user experiences.